Coming soon... The Highlander's Stolen Heart! 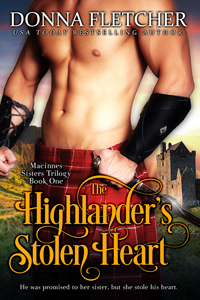 The Highlander’s Stolen Heart will be released this month, June 2014. Look for release date info coming soon! I’m really looking forward to this book, I can’t wait for it’s release. I am really looking forward to reading it. I had this book in my Amazon Cloud docs saved from Donna, but was accidentally deleted; now I have to buy it. Donna can you please send it again to me? Thanks.